Keep the heat in or out. Anywhere you want. 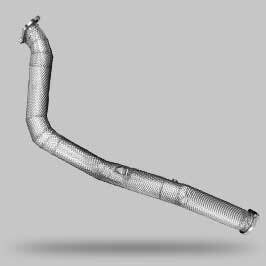 Due to complexity of the process and wide variety of parts and components that can be wrapped, we provide time and cost estimates on individual basis. If you're interested in wrapping your parts with HeaderShield™, please fill out our short Quote Request form. HeaderShield is a bi-layer insulation and encapsulation system for anywhere you want to keep the heat in or out. 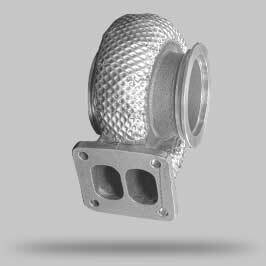 Consisting of special, inner insulation layer and durable, stainless steel outer shell, HeaderShield™ provides much higher insulation values, durability and mechanical specs than ceramic coating or conventional exhaust wrapping tapes. HeaderShield™ direct insulation system is designed to withstand long-term temperatures exceeding 1100 degrees Celsius in harsh environments. It is water, oil and vibration resistant and can be applied to wide range of materials - stainless steel, aluminum and other non-ferrous metals or even plastics. Lightweight and easily customizable Headershield™ is environment-friendly and not hazardous during manufacturing, installation, handling and use. Headershield™ IS NOT a do-it-yourself solution. Your components must be sent to our location for proper application of Headershield™ wrap. Insulation for crucial engine components that should be kept as cool as possible - intake ducts and manifolds, ECU housings etc. 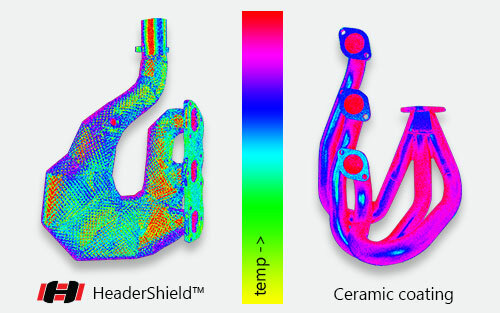 Virtually any part or component that needs to be kept hot or cool. 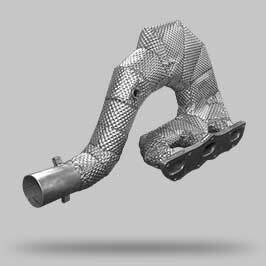 This includes exhaust and intake system parts and active components. 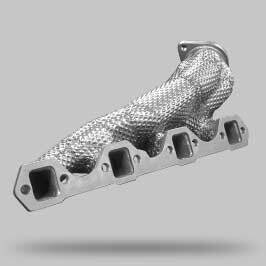 Catalytic converters and DPF filters are kept hot, while intake manifolds and ducts, sensitive electronics housings etc are protected from heat by use of HeaderShield™. How exactly does it improve power output? Higher (and stable) temperatures increase speed of gases in exhaust system for better scavenging and reduced turbo lag. Cooler intake systems provide better volumetric efficiency. How does it compare to traditional heat control? In various applications HeaderShield™ produces up to 80% better insulation compared to conventional solutions. It eliminates problems of flaking off common for ceramic coatings due to improper application or overheating. Please see our example pricing and contact us for detailed quote. Despite higher initial cost, HeaderShield™ provides much better value, due to its durability and longevity. How long does it take to get my header wrapped? Usually it takes 3-5 days + shipping time both ways, depending on size and complexity of your part / component. Contact us for details. Does it come with any warranty? HeaderShield comes with 1-year warranty against manufacturing defects. Does not cover normal wear and tear. No warranty on components used in racing. Warranty repairs not to exceed original cost of component processing. Protect firewalls, body panels etc. 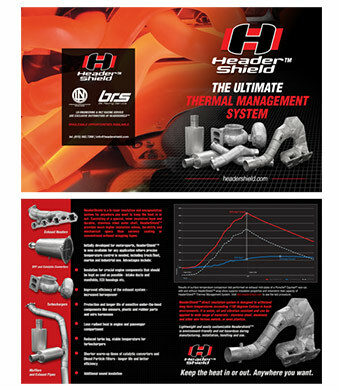 Bilt Racing Service / LN Engineering are exclusive distributors of HeaderShield™. Contact us with questions, comments and quote requests.